Discussions Magazine Music Blog: VV BROWN/Travelling Like The Light: Available April 20th, 2010! 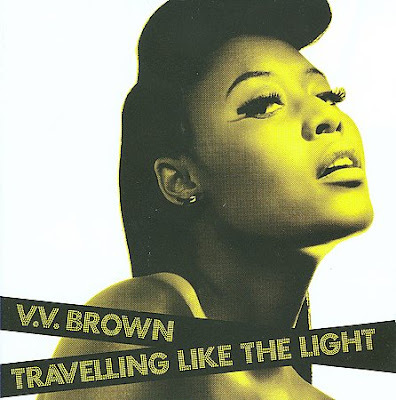 VV BROWN/Travelling Like The Light: Available April 20th, 2010! Eagerly awaited debut album from the fast rising singer/songwriter/producer. V V, who made the Top 10 of the prestigious BBC Sounds 'Poll' of new artists to watch out for in 2009, has been previewing songs from the album on her recent live appearances with the likes of The Ting Tings, Ladyhawke, Florence & The Machine and Antony & The Johnsons. ''V V Brown certainly has the makings of a star, beauty, a big voice: success on a huge scale seems a foregone conclusion. ''-The Independent. ''A one-woman sound-clashing whirlwind, she oozes glamour... Electrifying!''-NME. Visit VV BROWN's MySpace page HERE!